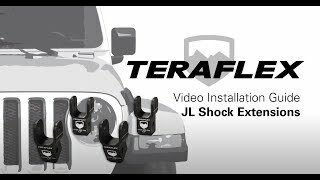 Use these TeraFlex JL/JLU: 2” Front & Rear Shock Extension Brackets to optimize extended and collapsed lengths of factory length shock absorbers on JL/JLU Wrangler models with a 2-2.5” lift. A must to restore proper handling and performance on your lifted rig. Perfect for those on a budget. These simple Shock Extension Brackets bolt to the stock shocks to extend their effective length.